Every culture in the world makes music. Music is part of the expression of what it is to be human. Its many functions fulfill our many needs: to set a mood, to work, to honor, to mourn, to connect to the spirit world, and to celebrate. Audible Humanity is a concert series featuring music from around the world, bringing together faculty and students from Intellectual Foundations courses in a collaborative effort to encounter and understand the meaning and function of this music within its cultural contexts. The series will include music from Australia, Ireland, India, South America, Africa, and the Caribbean. 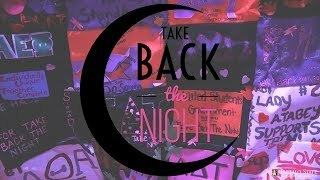 Honoring Buffalo State's Year of the City, all of the performers in this series have significant ties to Buffalo, and many of them are alumni. 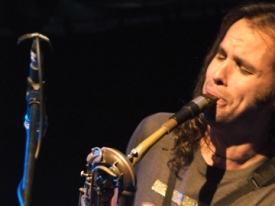 Thursday, September 13, 6:20–7:20 p.m.
Born and raised in Buffalo, New York, composer/improviser, saxophonist, multi-wind instrumentalist Steve Baczkowski began playing alto saxophone at age eight before switching to baritone by the time he was twelve. He studied music in high school at Buffalo Academy for Visual and Performing Arts and went on to studies in music, saxophone performance, literature, and ethnomusicology at the State University of New York at Buffalo from 1994 to 1999. In 1999, Baczkowski became the music director of Hallwalls Contemporary Arts Center where he has since produced and presented over 300 concerts of contemporary music and multimedia performances as well as several community-based artist residencies. The Celtic Circle Ceilidh (CCC) Band's rich sound comes from seven accomplished musicians performing over 15 diverse Celtic based instruments. With the addition of layered vocal harmonies, the group presents Celtic music with energy and passion. 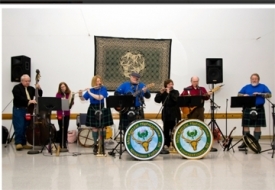 Collectively, CCC Band members perform with other acts including a bagpipe band, a flute ensemble, and a rock/blues band which adds the CCC Band's eclectic approach to Celtic music. There are strong connections between this band and its hometown of Buffalo. Three members of the CCC Band—Nick Ricciuti, Michele Ricciuti and Gary Ashby—graduated from Buffalo State. 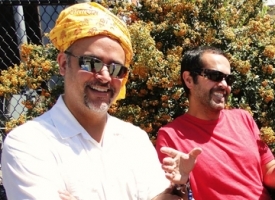 Western New York natives, brothers Ravi and Naryan Padmanabha have been performing together for over 15 years. 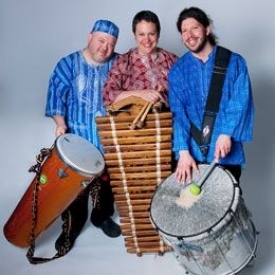 Their musical style blends together traditions from India, Africa, and South America. Their performance will feature the Indian instruments of sitar, tabla, santoor, and bulbul tarang. Indian music is known to have evolved around the interaction of three layers of sound; drone, rhythm, and melody. These layers work together to bring about a satisfying balance of repetition and invention, making Indian classical music one of the most well-known and well-loved world styles. 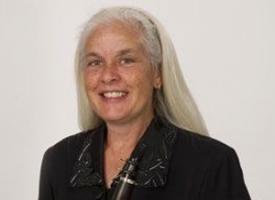 Clarinetist Crystal Hearne Reinoso has been a member of the Buffalo State music faculty since 1989. She currently teaches clarinet, music theory, and woodwind techniques, and directs the department's woodwind chamber music program. Reinoso recently completed a semester-long sabbatical of travel and study focusing on Brazilian choro, a classically-based popular music form. The high point of this experience was her month in Brazil, where she studied with some of the most important choro clarinetists in the country. Buffalo State music faculty and friends will perform a variety of light classical and popular styles from Argentina, Brazil, Cuba, Mexico, and other Latin American countries. Performers include Reinoso, clarinet; Holly Bewlay, voice; Emily Boyce and Ivan Docenko, piano; Ellen Barnum, bassoon; Marlene Witnauer, flute; Evan Drummond, guitar; and Tiffany Nicely, percussion. Diaspora Drum and Dance is an ensemble dedicated to studying, teaching, and performing traditional music and dance of the African diaspora. Lead drummer Ringo Brill is a Buffalo State alumni who has traveled extensively to study world percussion. The group's performance will include music and steps from Guinea, Ghana, Mexico, and the Caribbean. 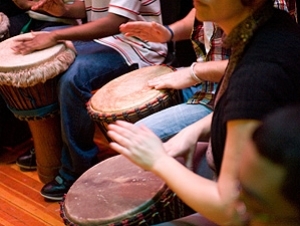 The Buffalo State West African Drumming Ensemble, directed by Diaspora member Tiffany Nicely, will also perform traditional rhythms on djembes and dun duns. For more information, contact Lisa Hunter, assistant dean of intellectual foundations and first-year programs at (716) 878-5906. All concerts taking place in the Recital Hall at Rockwell Hall require a ticket. Admission is $10. All students are admitted free, but must get a ticket. Tickets go on sale Tuesday, September 4, at 9:00 a.m. at the Rockwell Hall Box office, charge by phone at 878-3005 or online at https://secure3.ticketguys.com/buffalo/. Free admission tickets are only available in person at the Rockwell Hall box office with valid student ID. The box office is open Monday to Friday, 9:00 a.m. to 5:00 p.m. and one hour prior to concert times.